Beschreibung: Pflanze hochwüchsig, 30 - 60 cm hoch. Stengel steif aufrecht, etwas hin- und hergebogen, im oberen Teil purpura überlaufen. Laubblätter 5 - 8, am Stengel verteilt und keine Rosette bildend. Grundständige Blätter bis 25 cm lang und 1,3 - 2,0 cm breit, stark gefaltet, ungefleckt. Blätter nach oben kleiner werdend, aus breiter Basis zur Spitze verschmälert. Der Blütenstand ist sehr langgestreckt und lockerblütig, bis zu 20 cm lang. Die Tragblätter sind purpura überlaufen, die unteren etwas länger als der Fruchtknoten, die oberen etwa gleich lang. Die Blüten sind relativ groß und mit Ausnahme der hellen Lippenmitte violettrot gefärbt. Die seitlichen Sepalen sind vollständig zurückgeschlagen, 11 - 14 mm lang und 5 - 6 mm breit. Die Lippe ist deutlich gelappt, die Seitenlappensind länger als der Mittellappen und stark nach hinten zurückgeschlagen. Die Lippe ist 9 - 12 mm lang und 14 - 18 mm breit. Der Sporn ist aufwärts gebogen und 12 - 14 mm lang, etwas kürzer als der Fruchtknoten, am Ende oft geteilt. Höhenverbreitung: Von der Küste bis etwa 1500 m.
Standort: Naßwiesen und andere geeignete Feuchtbiotope. Naturschutz: Im Mittelmeergebiet durch Trockenlegung von Feuchtbiotopen stark zurückgehend. Bastarde: Nachgewiesen mit O. coriophora, longicornu, morio und palustris, sehr selten sind Gattungsbastarde mit Serapias cordigera, lingua, neglecta, vomeracea und A. pyramidalis. Bildnachweis: 15.4.1979, Tarbes (Südfrankreich), H. Baumann. Description: Plant quite tall, 30 - 60 cm high. Stem stiff upright, slightly bent back and forth, crowded at the top of purpura. Leaves 5 - 8, distributed on the stem and not rosette-forming. Basal leaves to 25 cm long and 1.3 - 2.0 cm wide, strongly folded, unspotted. Leaves smaller and smaller, from a broad base to the tip narrowed upwards. The inflorescence is very elongated and loose, up to 20 cm long. 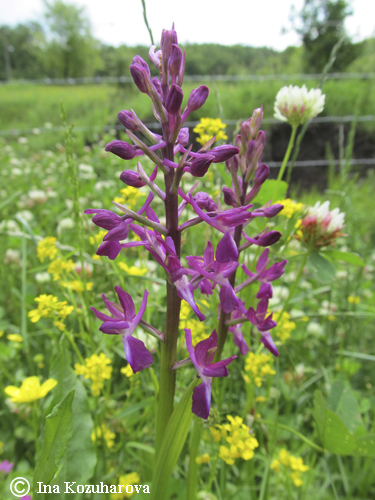 The bracts change color to purple, lower slightly longer than the ovary, that top of approximately equal length. The blossoms are violet-colored, relatively large and except for the bright lip middle. The lateral sepals are completely repulsed, 11 - 14 results mm long and 5 - 6 mm wide. The lip is clearly lobed, the lateral lobes are repulsed back longer than the middle lobe and strong aimed too far back. The lip is 9 - 12 mm long and 14 - 18 mm wide. The spur is bent upward and 12 - 14 mm long, slightly shorter than the ovary, often end up divided. 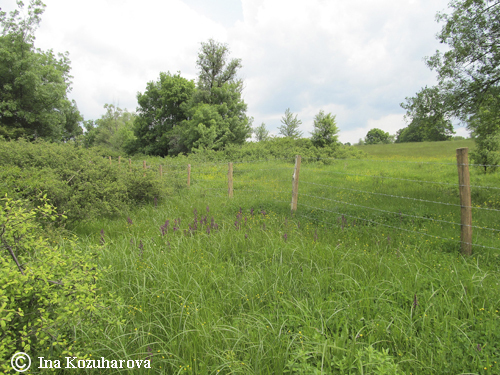 Height Spread: From the coast to about 1500 m.
Habitat: wet meadows and other suitable wetlands. Conservation: In the Mediterranean area through drainage of wetlands heavily going back. Bastards: Proved with O. coriophora, longicornu, morio and palustris, are very rare genus bastards with Serapias cordigera, lingua, neglecta, vomeracea and A. pyramidalis. Origin pictures: 04/15/1979, Tarbes (South of France), H. Baumann. 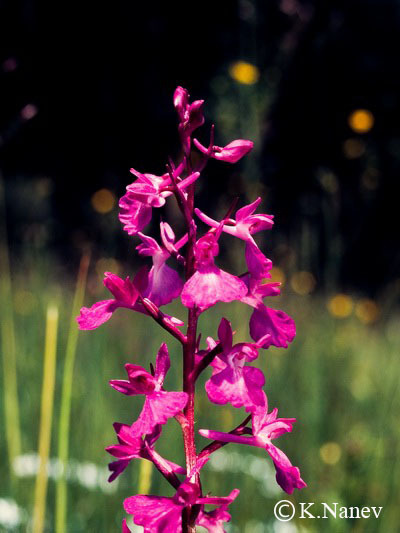 Anacamptis laxiflora (lax-flowered orchid, loose-flowered orchid, or green-winged meadow orchid) is a species of orchid. Wide distribution range in Europe and Asia as far north as in Gotland (Sweden). Tall plant, grows up to 60 cm high. 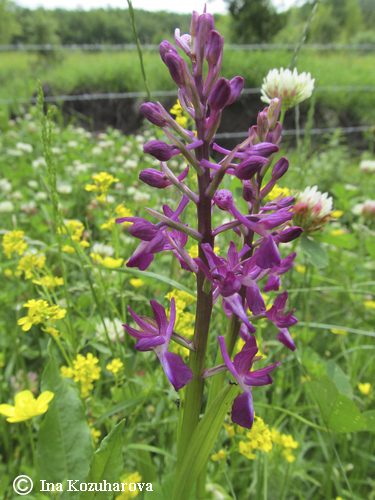 Found in wet meadows with alcaline soil. 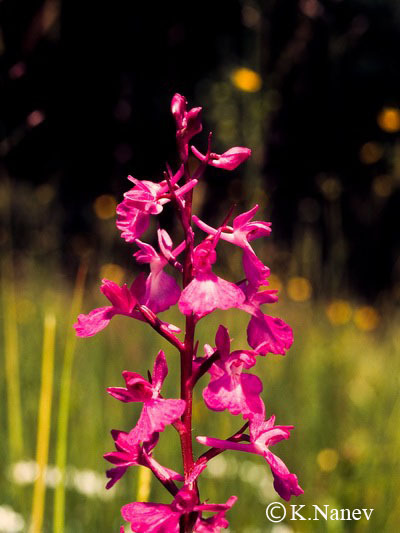 Common in Normandy and Brittany (France), in United Kingdom represented only on Channel Islands, where it is called Jersey Orchid. 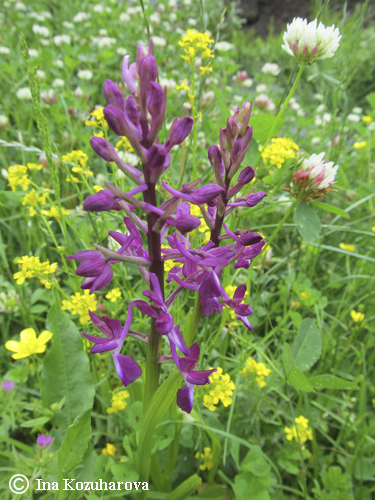 Notable habitat is Le Noir Pré meadow in Jersey, where each year in late May - early June can be observed mass bloom of these orchids. Perennials. Oval tubers. Stem up to 60 cm high. Leaves Lancet pointed. Inflorescence lanky cylindrical, loose. Bracts lanceolate, long as ovary. Blossom purple. Perianth leaflets lanky, blunt. The two outer turned backwards, others gathered in the helmet with 1/3 shorter than external. Lip in its general outlines almost triangular or wedge semicircular, purple, basically whitish, in front of three parts. Side shares broadly oval, highly spread. The middle shorter front cut or slightly indented, sometimes almost absent. Spur horizontal, gradually curved upward, shorter than the ovary. ssp. elegans (Heuff.) Soo Not. Berlin (1926) 910; O. elegans. Heuff. Flora XVIII (1835) 250. Oral heart back. Blossoms large. Spur little shorter than the ovary or nearly as long. This subspecies in the country has more widespread than the typical species. Flowering Time: Bloom: IV - VII. 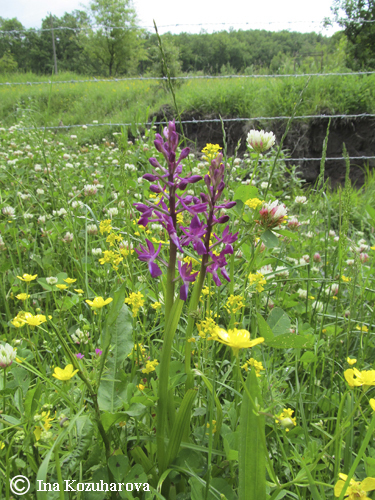 Distribution in Bulgaria: In wet meadows and marshes. In the lowlands and foothills up to about 1000 m altitude in different parts of the country (Bulgaria), usually in large quantities. (Conspectus of the Bulgarian Vascular Flora) = conspectus&gs_l= Zlc. Distribution: Central and Southern Europe, North Africa, West Asia Minor.